I have never been a fan of spam, neither the canned kind nor the comment kind. So I’ve had to toughen up on allowing people to comment. For now I haven’t asked that people register if they want to comment. I’m hoping the measures I’ve put in place will do the trick. I do run a good spam catcher, but it is so annoying to find that some scumbag spammer has flooded my little blog with over 100 comments in one day. That is not on. If the spammers leave me alone, I’ll loosen the ropes. But for now, I’m sorry, but blame those idiots who have nothing better to do with their time but flood other people’s blogs. They can’t create anything themselves, they can only spoil what other people have done. You know you’ve become disturbingly obsessed with all things papery and postal when you dream about them. A couple of mornings ago I awoke from a lovely dream that made me feel all happy. A dream about paper! In my dream I went shopping in a junk shop and was delighted to find two bundles of vintage airmail paper and envelopes. Of course, I was going to buy them immediately. If not sooner! Then after further rummaging I found a battered box that was covered in faded scraps. The box was full of gorgeous writing sets from the 1950’s and 60’s. There were all sorts of lovely paper and envelopes and even some equally vintage fountain pens, still in their boxes. I bought the box-full as well as the airmail bits. When I woke up, I had just gone back home (in my dream) and was gloating over my delicious find. As my daughter said, “Mum, you’ve got a Johnny Depp calender on the bedroom wall and you dream of writing paper!”. Oh yes fellow paper fans, my name is Eunice and I am a paperholic. 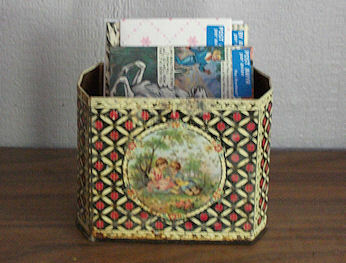 The box is an old tea caddy that I, aha, appropriated from the derelict house. This house has been empty for more than forty years, thanks to two families being constantly in dispute about it. The window of the kitchen, at the back of the house, is broken and there are a tea pot, a few cups and saucers and so on. I saw the box one day and took a fancy to it. It was probably bad of me, but I coaxed my daughter to fetch the hen net (a very large fishing net which I used to use to catch naughty hens). And she used the net to knock the box off the shelf, and caught it. I gave the box a good clean up; thankfully the lid was very tight so there was nothing nasty lurking inside. And now it sits in the living room and I put outgoing letters and cards into it. Well, better than it being forgotten and sitting on a shelf in a derelict house. I’ve just put an order in at TigerPens for a Pilot Pluminix fountain pen. Ooooh, I love new pens! Which brings me to the cartridge pen I bought yesterday. Not a new one this time though. I’d gone into “Craft” in Aber earlier that day and bought around 16 old girls annuals. (My wonderful daughter spotted them!) Craft, I should explain, is really just a glorified junk shop. When I went back later to collect the books, I noticed something very interesting in one of their display cabinets. To whit: a pack of aerogrammes. And not just aerogrammes, but unused ones! There’s three from the Royal Mail trains issue and a plain blue one. I haven’t seen an aerogramme in donkey’s years! I remember using them to write to penpals back in the 1970’s, from the age of 11. I don’t know why RM don’t sell them anymore. I will probably use them to write letters; I’m not really a collector. I’m also planning to use one to make a template, so that I can cut my own aerogrammes from scrapbooking paper. I think they’ll look rather nice. They cost £6 for the pack, which is not bad. I also bought that cartridge pen I mentioned earlier. I don’t know what make it is, it’s just a generic cartridge pen, with a blue marble and an italic nib. But it was only £2.50 and it’s another pen to write with, and I have one on the way! Lovely! I’ve always wanted a letter-writing kit for writing on the go. Which is funny, when I tend to stay at home and don’t really go anywhere. Anyway, when I saw this in a shop in Portmeirion a few weeks ago, I had to buy it! It’s perfect for keeping paper and stuff in it. It’s meant to be a laptop cover for one of those little laptops. You know the kind; people take them on trains and tap, tap tap away at them all the blessed time. 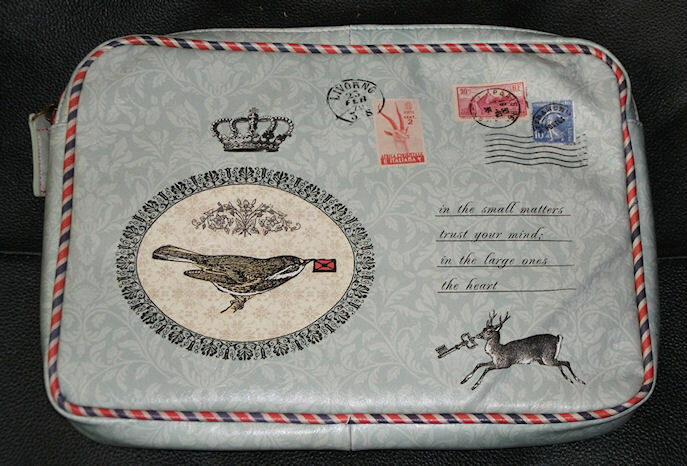 It’s airmail themed, which is just lovely! Now, all I have to do is actually go somewhere so I can write and go!